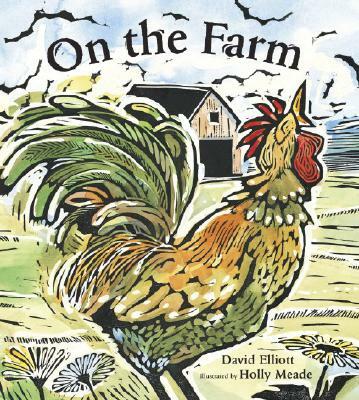 From an alluring cover with a rooster in full crow to its concluding, gently ironic ode to the silence of rabbits, this book will make an unusually interesting choice for farm-animal storytimes. Handsome…From toddlers to the youngest poets, children will delight in the fun and beauty on display here. Meade’s beautiful, color woodblock prints that superbly reflect the mood and action in the poetry. Energetic woodcuts accompany playfully simple poems as they give young readers an engaging tour of the barnyard…a worthwhile addition. [The text is] pithy and crisply rhymed, making for easy reading and listening…Meade’s watercolored woodblock illustrations are elegant yet homely, cheerfully depicting the unpolished charm of a well-filled pigpen. Like the vibrant rooster on this oversize book's jacket, Meade's colored woodcut prints are so bold they seem to crow at the reader. Elliott’s verses capture a reverence for animals unfamiliar to cityfolk, and Meade’s watercolor and woodcut illustrations…are serene and beautiful. Brings the entire barnyard to life. David Elliott s short snappy rhymes pair perfectly with Holly Meade’s energetic woodcut watercolor illustrations. The woodblock prints and watercolors…are detailed and enchanting. An enchantingly illustrated poetic ode to barnyard life. This is one picture book that your preschooler will want read over and over again. David Elliott’s graceful, simple verse and Holly Meade’s exquisite woodcut and watercolor illustrations capture a world that is at once timeless yet disappearing from view — the world of the family farm. Pleasingly simple yet verbally sophisticated verses…large, delightfully bold, animated woodcuts…begs to be read aloud. A delightful collection of poems that are funny, beautifully descriptive, and perfect for reading out loud.